Himachal Pradesh become the Union Territory on 1st November 1956. Kangra and most other hill areas of Punjab were merged with Himachal Pradesh on 1st November 1966 though the status remained that of the Union Territory. .
On 18th December 1970 the state of Himchal Pradesh Act was passed by the Parliament and the new state came into being on 25th January 1971. 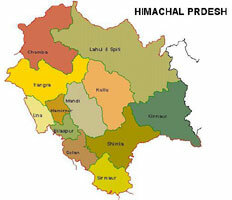 Thus Himachal Pradesh emerged as the 18th state of Indian Union.